On Saturday, June 30th, 2007 Inlaws & Outlaws played to a sold-out crowd at the Port Townsend Pride celebrations in Port Townsend, Washington. The 1:00pm screening drew crowds away from the gorgeous sunny afternoon to see this award-winning film. 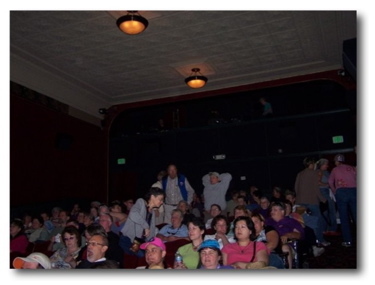 The movie was brought to Port Townsend by Peninsula Pride, the Rose Theater, and Port Townsend resident and Inlaws & Outlaws supporter, Joe O'Byrne. Filmmaker, Drew Emery was available after the screening to answer questions. Drew described the day in Port Townsend as a "loads of fun, the way Pride was meant to be." The Rose Theater in Port Townsend hosted the screening, which quickly sold-out to an audience of both LGBT and straight folks. The Peninsula Pride Alliance is dedicated to nurturing and strengthening the Gay, Lesbian, Bisexual, Transgender, Questioning, Intersex and Allies community of the North Olympic Peninsula through education and celebration of our culture. Their cornerstones include educational, social and networking opportunities, and supporting the development of a coherent community, as well as organizing the annual Pride festivities. 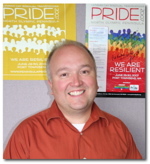 Joe O'Byrne, a Home Consultant for Countrywide Home Loans, took the lead role in getting the film into the Pride celebrations. Joe, who lives in Port Townsend with his partner, Tim Nunnamaker have been long-time supporters of the film. From the very first time they saw the film, they have contributed and spread the word about the exciting and far-reaching work of Inlaws & Outlaws and the Hearts + Minds Campaign. "This film has had a profound impact on both my partner and I. So we sponsored bringing the film to our community in Port Townsend. It played to a sold-out house and response was phenomenal. It's still the talk of the town!"